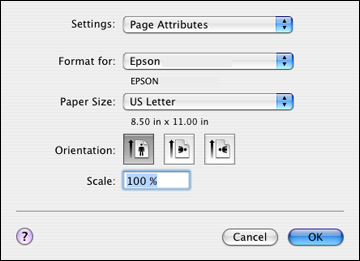 Select the page setup settings for the document or photo you want to print. Select the Page Setup command in your application. Note: You may need to select a print icon on your screen, the Page Setup option in the File menu, or another command. See your application's help utility for details. Select your product as the Format for setting. Select the orientation of your document or photo as shown in the page setup window. To reduce or enlarge the size of the printed image, select a different Scale setting.